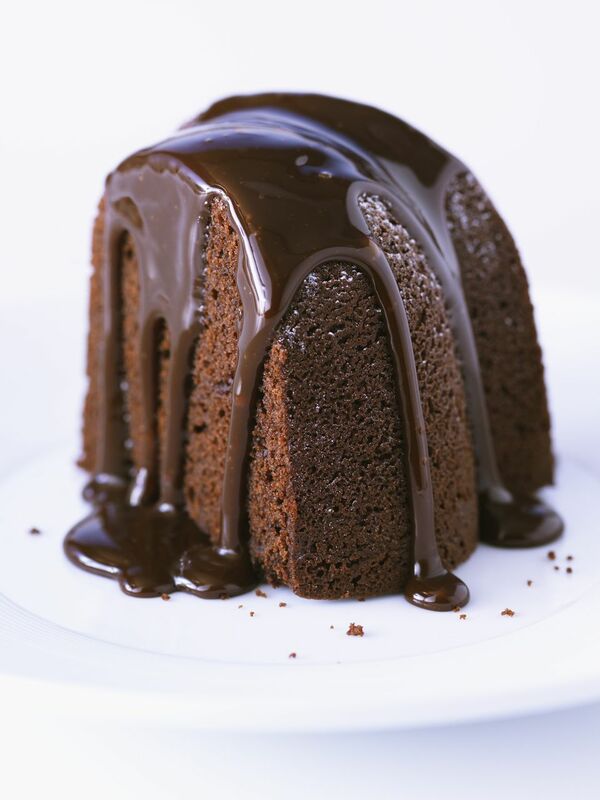 This dark chocolate Bundt cake is a chocolate lover's dream. This is a delicious and intensely chocolate cake, especially if you use a high-quality cocoa powder. Generously grease and flour a 10- to 12-cup Bundt pan. Melt butter in a large saucepan over medium-low heat; add cocoa, stirring until smooth. Whisk in the water and remove from heat. To the warm cocoa mixture, add the sugar, sour cream, 1 tablespoon vanilla, and eggs; whisk until smooth. In another bowl combine the flour, soda, and salt. Add all at once to the first mixture, whisking until well blended. Pour batter into prepared pan. Bake for 40 to 45 minutes, or until it feels firm to the touch and has slightly pulled away from the sides of the pan. Cool in pan on a rack for 20 minutes. Carefully loosen the cake with a knife and invert onto a large plate. Chop chocolate and put in a small bowl; set aside. Combine the heavy whipping cream, corn syrup, and 1 teaspoon vanilla extract in a small saucepan. Cook the mixture, stirring, until it comes to a boil. Pour the hot cream over the chocolate and whisk until smooth. Let the ganache cool to room temperature and then spoon over the cooled cake. If too thick, thin it with a little more cream. *If you're using a standard baking cocoa (not Dutch-process or high-quality) add 1/2 teaspoon more of baking soda to the dry ingredients.